These are the wooden mashtun and fermenting vessels. 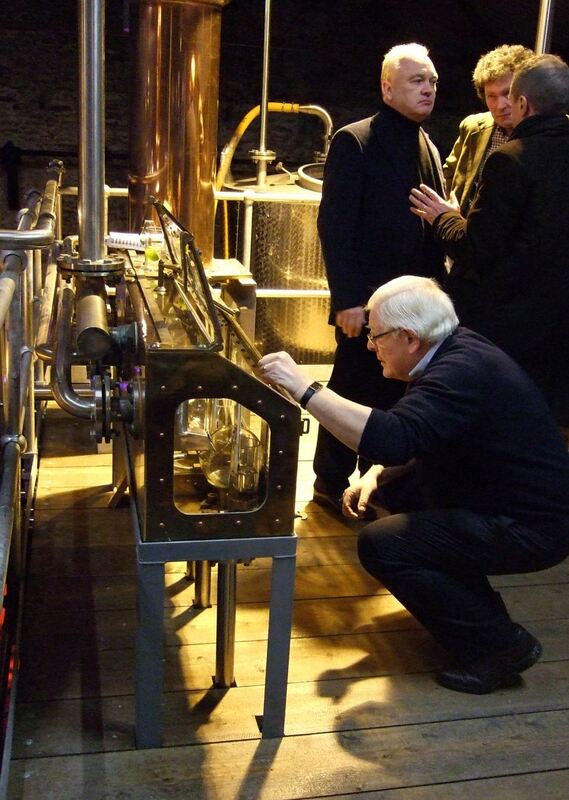 Here's John himself, monitoring the cut from the second distillation stage. Part of the art of distillation is capturing only the best part of the distillate, which then continues to the next stage (another distillation or maturation in wood). There is nothing automated in this distillery. Behind John is Oliver Hughes, founder of The Porterhouse Group and prime mover of the whole venture. 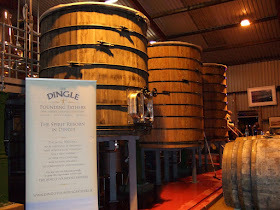 It was Oliver's strong connection with Dingle that let to the siting of the distillery in the town. On the night, not enough of the second stage distilled spirit had yet been collected to fully charge the third pot still. 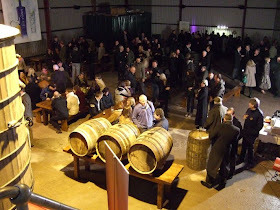 These three casks stood ready, though, to receive the final spirit. I called by the distillery when leaving Dingle the next morning to make a final check on progress. 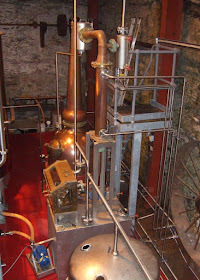 According to John, it would be Saturday, December 1st, at the earliest before the third distillation was ready to go. There is one more pot still tucked away, below and to the side of the other pots. It's tricky to get a photograph of it now because the distillery is tightly laid out with the pots, mashtun, fermenters, receivers, pumps, etc, nested within a lattice of pipework. 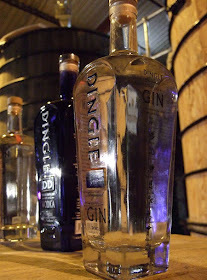 A very fine grain neutral spirit sourced from Sweden is the base for both the gin and vodka (without a column still, the Dingle Distillery cannot produce neutral spirit). 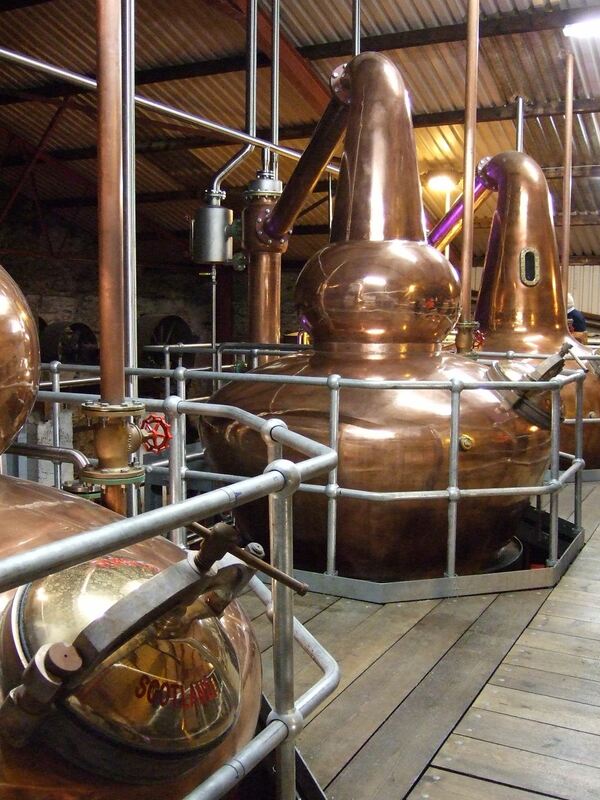 In the case of the gin, the botanicals are steeped in the spirit during distillation. Even more flavour is extracted by inserting a tray of botanicals above the pot, through which the alcohol vapours pass before condensing. ... nine traditional and locally grown & harvested botanicals: rowan berry, juniper, fuschia, bog myrtle, heather, chervil, hawthorn, angelica and coriander. 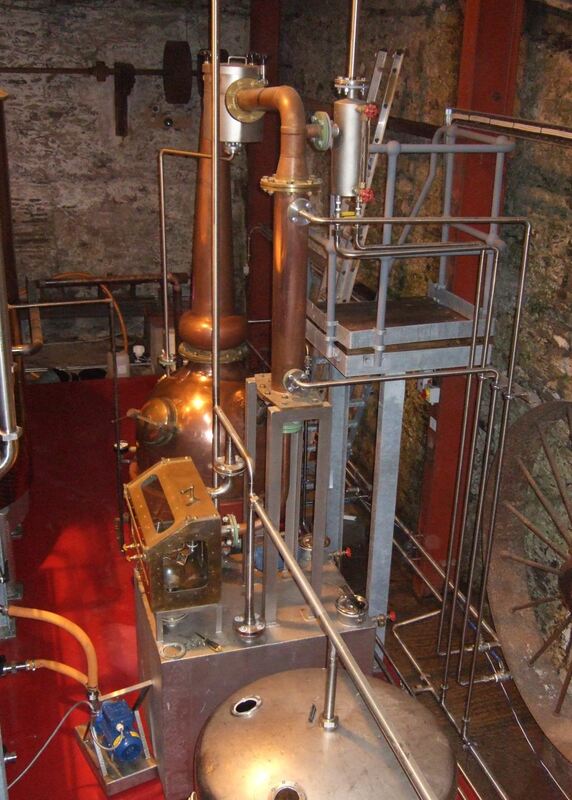 The resulting distillate is cut with pure water drawn from our well 240 feet below our distillery. I wasn't tasting under laboratory conditions but I noticed that the juniper is quiet in the mix, allowing grassy notes and even a mild citrus (let's say pomelo) to come through. I'm not sure they are entirely finished tweaking the balance so it may yet change. The vodka is distilled in Oisín too, then charcoal filtered. I have little knowledge of vodka but I have never heard anyone suggest it should be savoured neat. This one has a surprisingly smooth and pleasant taste though. Michael Lawlor of the Celtic Whiskey Shop immediately picked out an aniseed flavour and he was absolutely right. The (hand-filled) bottles have a handsome, chiselled look. The gin bottle seems impossibly translucent, refracting its surroundings like the cloaked alien in Predator. The vodka one has the blue cast of an antique medicine bottle. I like seeing glass - a truly amazing, under-appreciated material - featured like this, and not obscured by labelling. The final approach to Dingle town requires driving over a mountain. At this end of the year, the road was mostly empty. I couldn't help thinking on the way up that there really couldn't be anything on the other side. But suddenly, there it is: a town, with the Atlantic Ocean right in front of it and the mountains pressing up behind it. It's wonderful. The Dingle Distillery will acquire all of the romantic associations of its setting: the ocean air, the landscape, the remoteness. The company logo is a Wren Boy with a sheaf of grain in one hand, a scythe in the other. Wren's Day (the day after Christmas Day) is a big celebration in Dingle, I hear. Though an Irish tradition it's quite exotic even to many Irish people (I have never seen Wren Boys myself in Dublin). The part of Dingle where the distillery is located is called Milltown. Looking at an old map of the area I can see there was a "corn and tuck mill" on the same site in 1841, and probably earlier ("corn" is any kind of grain in Ireland, "tuck" is wool-combing). 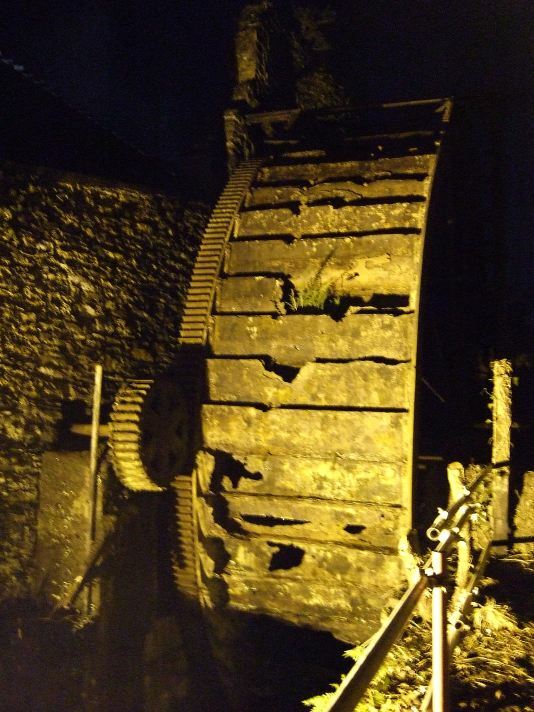 It was still a corn mill when the 20th Century arrived, judging by another map. There is a corresponding wheel on the inside, which you can see in the photo of the gin still, above. The building has been made weatherproof and enlarged with corrugated iron. It's purely utilitarian but there is potential for a more picturesque restoration down the line. There is a bit of a foodie culture happening in Dingle that a local whiskey would slot right into. 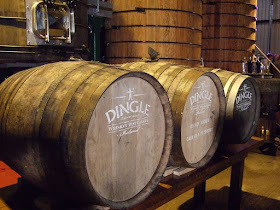 There is the Dingle Food Festival each year, for example. Before I left Dingle yesterday, I picked up some locally-made charcuterie, oak-smoked fish and cheese, all great accompaniments for whiskey. All of this - the location, the history, the local artisan community - makes Dingle, despite the youth of the venture, a true home of the independent, Irish craft of whiskey-making. You can still become one of the Founding Fathers of the distillery by buying one of the first 500 casks up front. There was a large display on the wall listing all of the Founding Fathers so far (including, sadly, Hugh O'Regan, whose funeral was yesterday). If you really needed one more reason to visit a beautiful part of Ireland, then how about to check on the maturation of your very own whiskey?